I have been hired by the British Antarctic Survey to spend 18 month at their Halley Antarctic station as a wintering electronic engineer, which will be surely the greatest adventure of my life so far, and probably the most typical topic on my blog in the next two year, so I created a separate page for this on my blog to collect not only the related posts, but all the other materials that I produce during this mission. Here is a schedule of my mission so you can know what can you expect and when. Antarctica related posts will have a separate category (‘Antarctic’), so they can be found all in the same place selected from the menu. Similar to the other posts these will discuss one certain topic in detail. Topics can be various from science via station life to sports. The posts will not necessarily will be written straight after something happened. A sequential description of the events will be described in the diaries (see below). 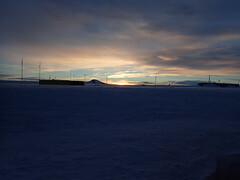 I intend to write a regular public diary about during this period including the training and preparations, the travelling and then the actual work and life at Antarctica. The diary will be edited into typically 3-5 page long PDF documents, illustrated with my own photos. The diaries are uploaded to a public drive and listed on a separate ‘Antarctic diary‘ page on this blog. You can find an interactive map of my journey to the Antarctica at this page available through Google Maps and downloadable KMZ too. The map contains both the past events (blue) and the future plans (grey) and it will be updated at each stage, so you can follow me through this as well. Links to the diary records are available by clicking on the dark blue location icons. All the photos made at Antarctica will be collected in various thematic or event based albums on my Flickr account. I plan to make quite a large number of photos, however the satellite connection will limit the number that I can upload from the station, so photos might appear later than posts and diary records, and some photos will even have to wait until I return from the Antarctica and I can flush the content of my hard drives on the web. You can find real-time and time-lapse videos on my YouTube account about the work and life moments during my journey to Antarctica. I attempt to record the everyday life at the Antarctica by making time-lapse videos about everything I can and editing the interesting moments into videos. 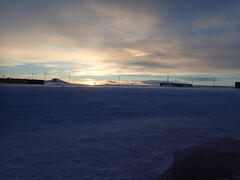 While the life at Halley is very isolated with no physical contact and limited communications with the outside world resulting that the wintering team of 16 literally lives there as a family, I still try to manage regular contact with my partner, family, friends and others. The simplest form of communication is e-mail, which I can check at least once every day, but there will be some very limited opportunities to make phone calls. Apart from that I have a common creative project called Draw’n’Tale with my partner Kata, which that has a separate facebook page, and I also try to finish a Woodswiever episode every month dedicated for my mother.